British Columbia boasts some of the highest diversity of salmon habitat that can be found anywhere on the planet, and maintaining these habitats is especially important in the face of global climate change. Much of these habitats are still relatively intact, and some fall within parks and protected areas. But in many parts of the province salmon habitat continues to be degraded or destroyed by urbanization, unregulated groundwater extraction, poor logging practices, mining for gravel and metals, oil and gas development; hydroelectric power development, open net-cage salmon farming and other human activities, compounding the negative impacts of climate change on salmon. Hatcheries have historically been used to mask the effects of habitat destruction, but they can decrease the genetic diversity of wild salmon and have their own set of potentially negative effects. See Threats to Salmon Habitat for more information. The responsibility to protect and conserve salmon habitat lies with both the federal and provincial governments, but their ability to carry out this mandate has been eroded in recent years by deregulation and severe funding cuts to provincial and federal ministries. 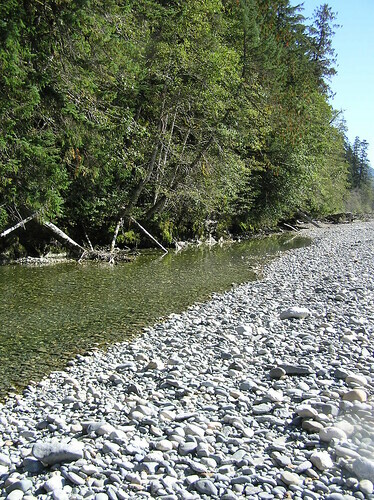 Watershed Watch helps to protect and restore salmon habitat by raising public awareness about specific threats to salmon habitat; reviewing and critiquing development proposals through the provincial and federal environmental assessment processes; and by participating in projects that aim to restore lost salmon habitat.